I mentioned on Saturday that I was making gur cake. I really didn’t expect the response I would get on all my social media channels from Dubs (people from Dublin), Corkonians (who call it chester cake) and Deise natives (from Waterford, who call it donkey gudge cake apparently). This is a cake that has huge heritage, and yet comes from a very humble beginning. There’s an old Dublin term used to describe a young boy, a messer, somebody who gets up to mischief. That word is “gurrier”. In the early 1900s this was a kid who probably lived in the city centre tenements, they’d duck and dive around the city centre, grabbing food as and where they could. In the bakery, any cake cuttings and stale bread on the floor at the end of the day went to the gurriers, who would bring them home to transform into a treat (Gur Cake) that is still made to this day in Manning’s Bakery. If you’d like to read more about life in the tenements at the turn of the century, see can you get your hands on a copy of “Gur Cake And Coal Blocks” by Éamonn MacThomáis. It’s not in print anymore but I know there are copies in public libraries around the country and I’m sure there is a copy in Marsh’s Library and the Trinity College library too. What I love about this cake is that it uses up leftovers and doesn’t leave a bit of waste from baking a cake. I love that it is traditional, it harks back to harder, more frugal times, and that it just goes to show the ingenuity that people had to make food stretch further. 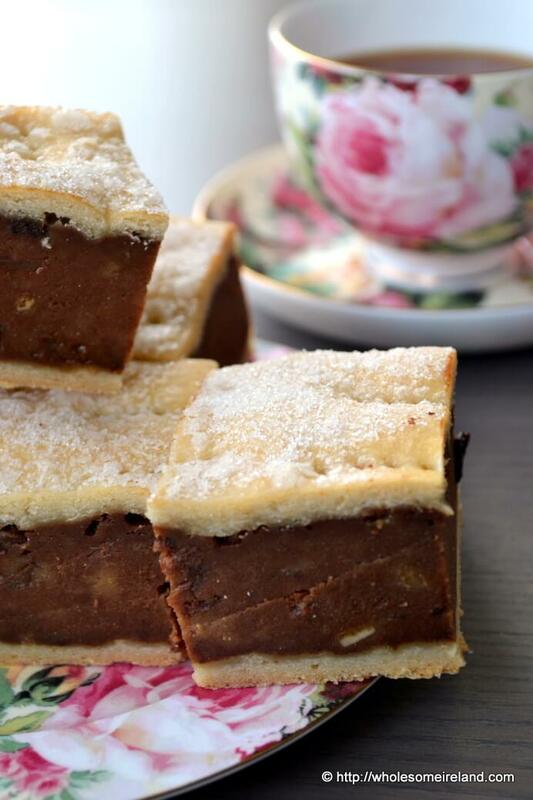 Gur cake is a traditional Irish food. Apparently there’s a meeting tonight to try and designate EU status in Cavan to boxty. How on earth somebody in Dublin hasn’t started the process for gur cake, I just don’t know! I made portercake last week and as per usual I made too much, then forgot to freeze it so I ended up with a full loaf of stale cake to play around with for this recipe. You can make far less, or if you’re lucky enough to pick up a stale fruit cake then it makes the best gur cake and also eliminates a couple of steps in the preparation process. Other filling suggestions that would work include gingerbread and crystallised ginger, madeira cake and chocolate chips, or brown breadcrumbs and soaked fruit. Preheat a (fan) oven to 160 degrees Celsius and line a deep baking tin well. I used a tin that was 18cm x 25cm and then a further 8cm deep. Divide the pastry in half and roll each section so that they will fill the tin. The pastry doesn’t need to rise up the sides so a little bigger is okay because you can trim the pastry. Place half the pastry into the bottom of the tin and trim if you have to. Prick all over with a fork. In a large bowl, combine the cake crumbs, tea, orange juice and ground spices. Stir well. Spoon the wet mixture on top of the pastry base and smooth until it’s level. Place the second half of the pastry on top of the filling and trim if you have to. Prick the pastry top all over with a fork. Sprinkle the top with caster sugar. Bake in the oven for 90 minutes. Remove and allow to cool completely before slicing. 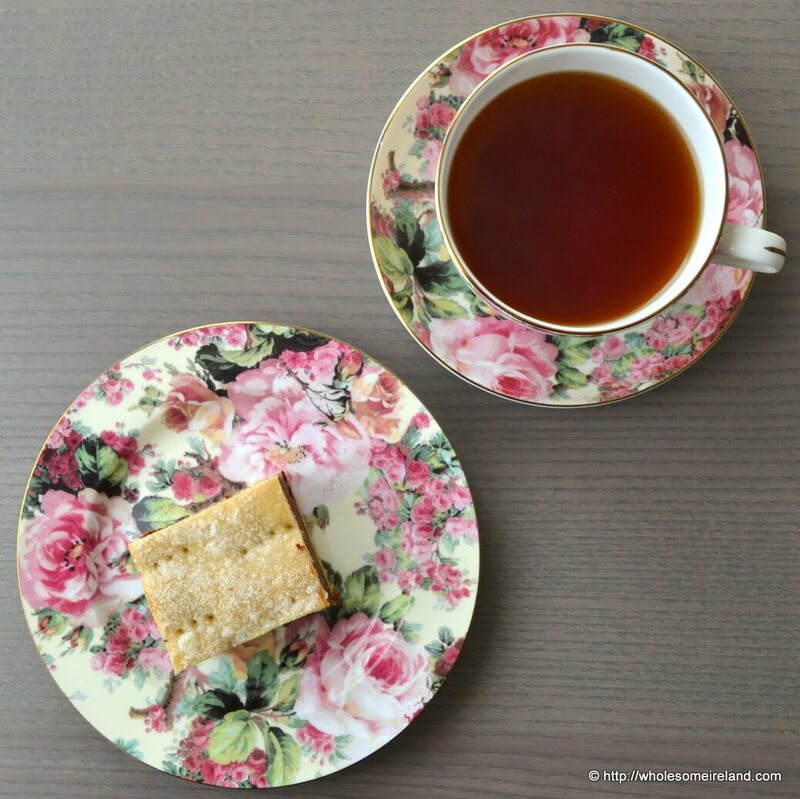 Enjoy gur cake with a cup of strong tea. Fabulous and so well presented. I am favouriting this. I should check out that book as my granny (born circa 1900) was from The Liberties. Oh yes the perfect book for some insight into her childhood! I had this in Waterford once….loved it! As a Corkonian living in Waterford I have been laughed at for calling this Chester Cake….I was the one laughing when I heard they call it Donkey’s gudge here! Well I hope you don’t leave it so long before you have it again! Takes it to a whole new level. Yum! This looks fantastic! I have never heard of gur cake, but I would definitely like to try it! Thanks, let me know how you get on if you do! Great cake, especially loved the history.. never heard of it before, must ask my parents if they know of it! I will have to try it! My father really enjoys these cakes, and wanted to add that in Moate, Westmeath in the 1950s, they were known as “Plum duffs”! Really enjoyed reading about the “gurriers”, a list should be made… I bet there’s a different neame in every county! I bet there is too! Oh childhood memories aplenty. My gran used to make this when I was little. I have a little christmas cake left over … it is bound for makings of gur cake now. Sounds like the perfect destination to me! And I’ve ordered a copy of Gur Cake And Coal Blocks, cannot wait to get reading. Have read the two gur cake recipes you have and i am trying this one as we speak. hope it works out for this afternoons picnic. Used half breadcrumbs and raisins. Delicious! Happy faces all over this house. I used the pre-made pastry and managed to make a quiche and a gur cake from one sheet. After doing a little reading I discovered you don’t even need crumbs, just soak the bread, slices/heels/cut off crusts, in the juice and tea and mush it up. There is very little sugar in this and with the raisins or mixed fruit you have a nice, child friendly ultimate frugal cake. Thanks. Brilliant. Glad you like it! Nor had I until people responded to me on Twitter! 90 minutes baking sounds very long considering the cake is cooked already. It might seem long but I’ve tested te recipe to get the right consistency! How did the gurriers get orange juice? Not hating, just interested? Hehehe I added in orange juice to my own recipe. Traditionally Gur Cake would have been made with tea only. Ohhh Hahaha, Well I made the cake, and it was still very good! I think the orange juice adds depth of flavor! Thanks for responding! Hey, do you live in Ireland? Your name Caitriona suggests you might. If you do I would really like to talk to you about something. My mam used to make this in (Newcastle(Geordie). She was a cook during the war, and used to add rum essence, . Delicious…. With or with out…. Oh I’ve never heard of it being made with rum essence. Sounds lovely! This Austrian here is trying this with stale Guglhupf. One hour to go until we can try it. It’s a bit if a shame that I can’t compare it to what it “should taste like”. I have never heard of this cake, though I lived in Dublin and worked in a café. It sounds good! I have to try this. In Australia, we knew this as “Squashed Flies Pie” or the easier to pronounce “Dead Fly Pie.” The more polite just call it fruit slice, which is most boring. Ah brilliant. We have squashed fly biscuits here as well. I love the description! In Count Meath it was also known as ‘Jack’s Wedding Cake! Very good I’ve never heard that one! I’m a Dubliner and yes i’ve Had Gur cake takes me back with pleasant memories. However, my Aunts recipe to my memory had a mixture of raisins & sultanas. Great desert with hot custard. Oh brilliant, I don’t tend to have it with custard but great suggestion! Isn’t it lovely how we all have our own recipes and memories of how to make things. Have you tried making it in her recipe at all? Hi Caitriona, I was born and raised in Waterford, it was in the 1960 on our way home from school we would stop to buy chesterbread. Depending on which bakery made it the consistency went from dry to juicy. I have made it myself here in Canada along with the Waterford Bla….as i miss them both. A very interesting read, my uncle Tommy was from the Liberties so i am well familier with the term Gurrier. Ah that’s brilliant I’m glad you like it!